A great alternative to potato gratin (and all of the carbs that goes along with it). I usually make my gratin with potatoes but having a diabetic father-in-law requires a little tweeking of some of my recipes. This recipe is a great lower carb alternative and is still quite decadent! I topped it off with a little bit of the Black Sheep Creamery cheese that was included in the most recent farm share but can be swapped out with an aged manchego or romano cheese. The caramelizing of the leeks and shallots add a wonderful depth of flavor to the dish. Enjoy! In a medium sized baking dish, layer thinly sliced rutabagas and parsnips (about 1/8 inch). Set aside. In a large saucepan, heat butter over medium-low heat. Add leeks and shallots and cook; stirring frequently until golden brown for about 20 minutes. Stir in flour and flour and cook until smooth, whisking out any lumps for about 2 minutes. Add heavy cream and fresh thyme. Stir for about 3-4 minutes until milk is heated. Add shredded smoked fontina cheese and stir until well incorporated and creamy. Pour half of the cheese mixture over the sliced rutabagas and parsnips. Agitate the baking dish to allow the sauce to coat well; continue pouring the sauce until it barley covers the slices. 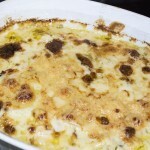 Top with grated manchego cheese and bake uncovered for 35 minutes or until tender.